These intricate opalescent windows use the same opalescent type glass as our Simple Opalescent and Classic Opalescent styles. However, they are more intricately detailed than the other opal styles mentioned. Portions of these windows may have pieces of glass no larger than a silver dollar. 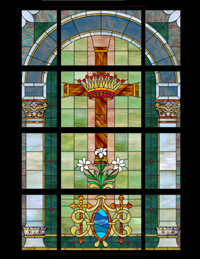 The top right example is from a set of 6 windows created for the newly renovated Liberty University Chapel (Lynchburg, VA). 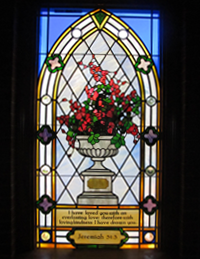 Each window featured a different floral centerpiece. 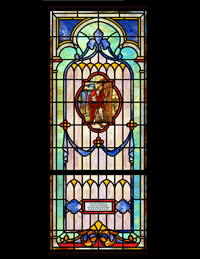 The flora was so tightly detailed that it was glazed in copper foil and then inserted into the leaded window. As with other opalescent styles, thematic medallion scenes can be selected from our New Testament “Life of Christ” series or from our collection of Old and New Testament symbols. Windows also feature a special area for optional memorial inscriptions.